Woven shredded receipts and checks. Made while waiting for lunch at awesome independent bookstore/cafe Kramerbooks & Afterwards in Washington, D.C.
Non-recyclable plastic spoon cut with Xacto knife. Quand certains sélectionnent des « sites du jour », d’autres s’aventurent dans le pari d’« une tête de mort par jour », Skull-a-day en anglais. Plus drôle que morbide, le blog - lancé le 1er juin par le collectif de design Another Limited Rebellion - est donc dédié à la représentation du crâne de squelette sous toutes ses formes et matières : en navet, en pixels, en tampon bleu, en livres, etc. 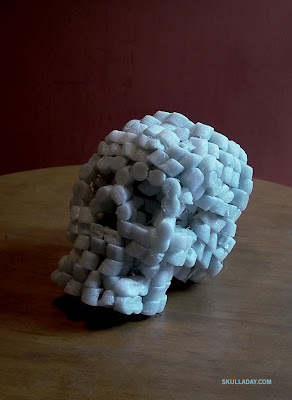 Foam packing peanuts and hot glue. Whew, that was ridiculous! I gotta do some easier skulls the rest of this week. Carved from small chunk of wood, which I found while walking on the Vita-course exercise trail this morning with my dad. 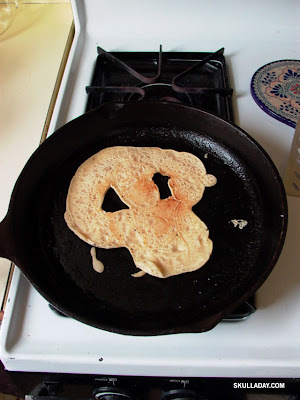 Vegan pancake batter (from The New Farm Vegetarian Cookbook). All of the vegetables in this week's share from my community supported agriculture group SPROUT. Loosely inspired by the work of Guiseppe Arcimboldo. Marilyn says, "Maybe you can do something with motorcycles"
Josh says, "Try a skull wearing Disney Mickey ears or a skull made out of bones from other parts of the body." Napi says, "A really curious image would be a skull made of feet" and "X-rays make us aware that skulls are not just on dead creatures, but walking around in us all. 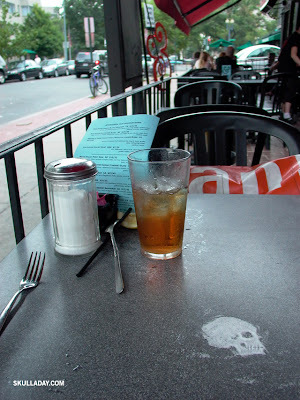 Guess that lends itself to interpretation of a crowd scene, or a busy city sidewalk, with all the skulls showing under the baseball caps & sunglasses &amp;amp;amp;amp;amp; make-up & hairdos"
Plus a big thanks to Teddy for including a link to Skull-A-Day on Design Observer. Site of the day on Écrans, a partner website of Libération. Push pins hammered(!) into heavily flyered pole on Harrison St. I swear I was into skulls before it was "cool". Seriously, ask anyone. 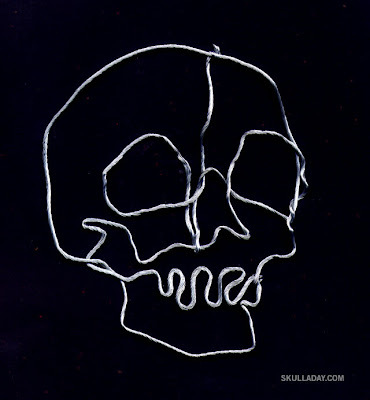 Thanks to Slowpoke creator Jen Sorensen for mentioning Skull-A-Day on her blog! 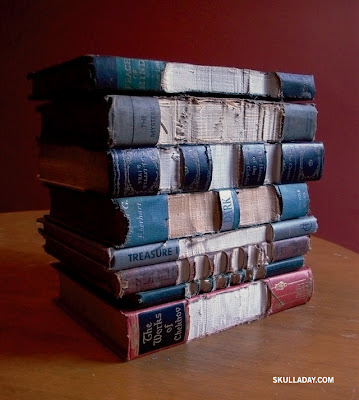 Books cut with a scroll saw. Expect to see this little guy again in other forms before the year is out. Do you remember that Tootsie Roll commercial where everything became a Tootsie Roll? I'm starting to have that experience with skulls now. I swear I see them everywhere. 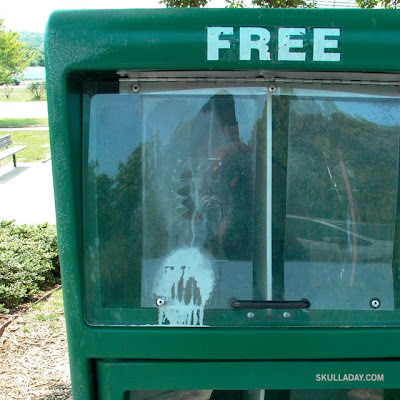 Remnants of a sticker on a newspaper box at a rest stop on 95 North just south of Washington D.C. and below, my interpretation. 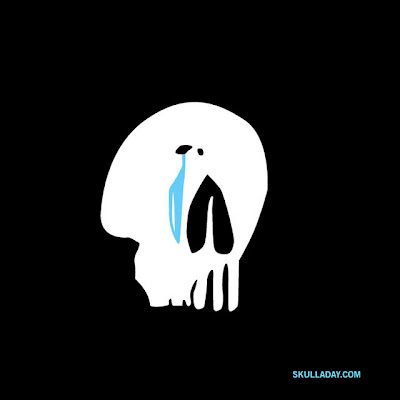 Why is the skull crying? 1. Baby Animals (preferably kittens). 2. Japanese Stuff (especially cartoons). Cut from cup lid made of type 1 plastic (PET/PETE Polyethylene Terephthalate) which is recyclable in my hometown of Richmond, VA.
"Hey guys, what does that cloud look like to you? Right there, in the middle. Doesn't it look like something familiar. Just stare at it a bit." 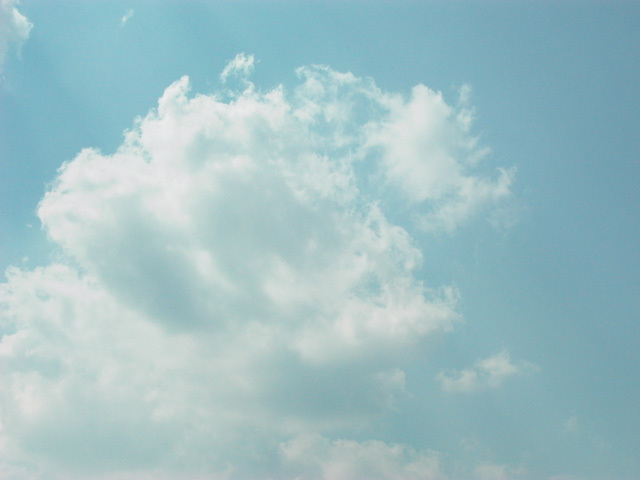 Slightly retouched photo of actual cloud over Maymont Park last weekend. 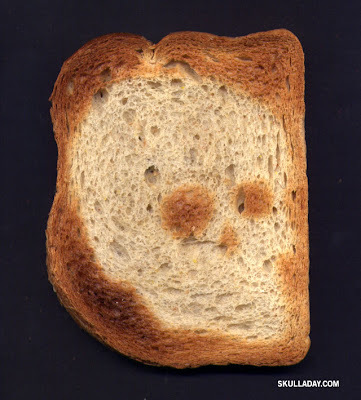 It really did look like a skull to me before I brought it into Photoshop see for yourself. Found metal. Inspired by the largest piece, which I found while bicycling down Lombardy St. to a breakfast meeting the other day. I found the jaw piece on the way back. 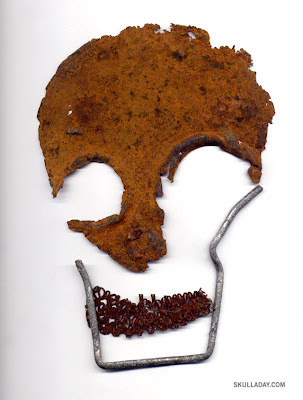 Thanks to Chuck for providing access to his rusted metal collection for the mouth. 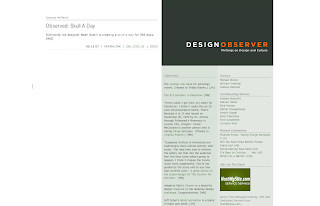 Skull-A-Day mentioned on Design Observer. The 48 Contiguous States (sorry Alaska & Hawaii). 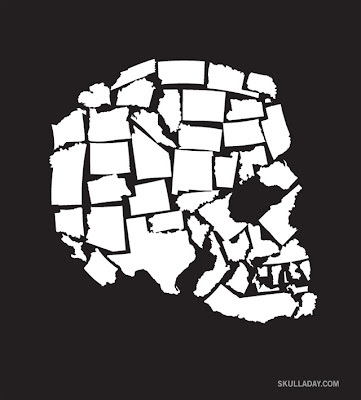 I was working on a client project with a map of the continental US and realized it might make good source material for a skull. P.S. This is now available as a limited edition T-Shirt! Cardboard box cut freehand with X-acto knife. Dry brush acrylic on magazine cover. Kris says, "1. Garden Skull (naturally,with flower petals if possible) 2. Kitchen Skull (bits of food, spices laid out on the counter top?) 3. Bathroom Skull (toilet paper, bit of old soap, sponge, etc) 4. 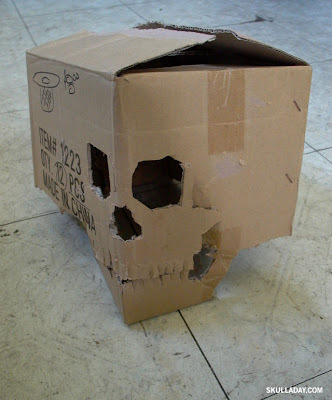 First Aid Kit Skull (sure to be fun with Band Aids!) 5. A month of mono-printed Skull (make a linoleum block and print it 30 different ways one for each day of the month. 6. 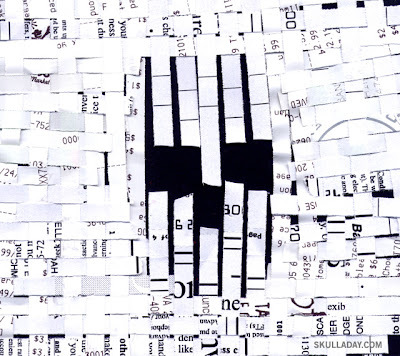 Chuck Skull (collaged debris) 7. Mim Skull (sewn maps, knitting debris) 8. 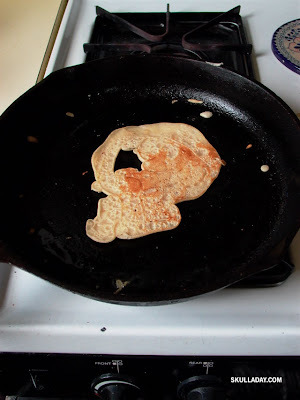 Facial Hair Skull (with all the varieties: the VanDyke, Soul patch, Mutton Chops, etc) 9. Soil Skull - (have people give/send you soil samples from assorted neighborhoods and make 'paint') 10. Travel / Vacation Skull (cut up photos from your trip to Istanbul - or wherever) 11. Phases of the Moon Skull (the eyes maybe could be in the shape of the waxing/waning)"
Christian says, "I was gazing through the aparment and my eyes fell on a pair of electrical outlets. Sockets as eye sockets - eh?" Dave says, "how about the real estate section of the newspaper? Old toilets/fixtures? Sand, leaves other temporal natural/unatural stuff summoning Andrew Goldworthy!" Grá says, "Oh, i also want to see a 3 or 4 panel skull comic strip (dialog? no dialog? same picture in every frame? 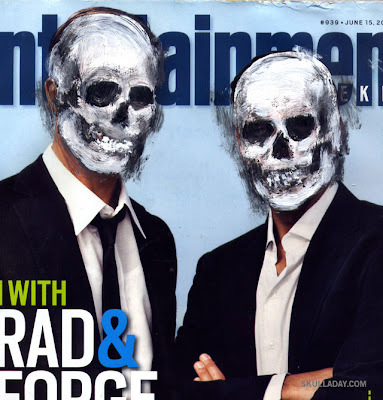 or two skulls talking to each other?) And a skull made of either lint or felted wool. And take some (#6?) 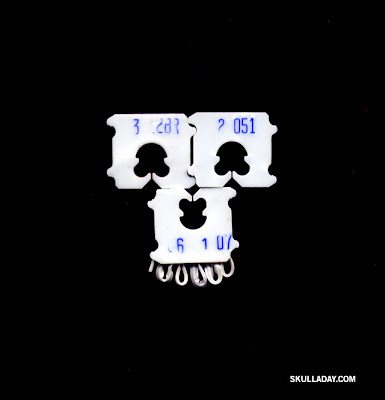 non-recyclable plastic, cut it into various skull shapes and make shrinky-dinks in your oven. And, two words, "wood burner" (otherwise known as pyrography, remember summer camp?) Clear plastic, drilling. Oh, and get a bunch of your hot friends to recreate Dali's skull (or it might be funny with a bunch of not so hot dressed goth types.)" halloween), a skull made literally of bones (from a taxidermist?, uh...), shadow art skull, 3-D computer generated skull, ice sculpture skull, ..."
Lindsay sent this image of a happy skull she spotted at a house show the other night. And Brad sent this bit of skull amusement he found. 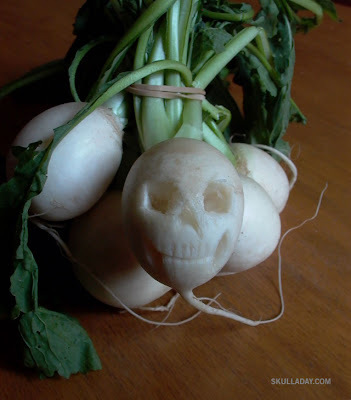 Carved with an X-acto knife from the fresh organic turnips I got from my farmer today, via my Community Supported Agriculture group SPROUT. One sheet of 4" x 6" notebook paper that has not been cut or torn. Made on the train between D.C. and Richmond. One continuous piece of hand-bent picture hanging wire. From Jen, "How about a teddy bear skull, or a dog skull full of confetti?" From Kathleen, "make one out of squash"
From Sarah, "you could do one in diamonds a la Damien Hirst..."
From Marc, "how about a recent portrait of Iggy Pop"
From Joy, "pour out liquid acrylic paint onto paper as you lift and wiggle it, which makes lovely color elements as it swirls and mixes, then cut it into shapes, in your case, skulls." 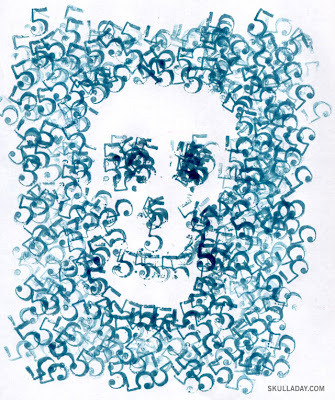 From Grá, "Well, clearly you need a 70's pencil crosshatch that is the word "skull" shaped into a skull. Then you should sign it 'crâne' which is French for 'skull'"
From Russ, "Dude, castle Grey Skull! The building [in Richmond, VA] right across Harrison St. from Pollack. It's totally got a giant skull in the side! Once you see it, it's so obvious and impossible to see it normally ever again! Check it out!" From Leah, "Care bear skull, wholesome cereal box skull, unicorn skull (that's right), vegetable skull, skull sundae with cherries on top, troll skull, candy skull, bamboo skull, skull of Anna Nicole Smith's mortician, magnetic skull, Magnetic Fields' respective skulls, skull's best friend, skull after a bad date, uber-femme skull, quintessential american skull, Paris & Tinkerbell behind bars skull..."
From Brad, "If I may offer, if you create a fist with your fingers extended, the wohle thing facing towards you - you draw two eye holes on the back of your hand and it creates a natural skull image (with fingers down to the knuckle defining the teeth)." 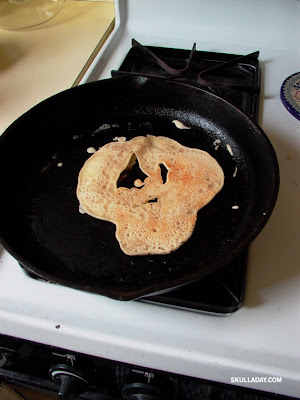 From Yoshika, "it might be interesting to find an accidental-skull too, instead of making? maybe? well, actually one day I saw foam from beer ended up looking like a skull on a glass... just an idea..."
You'll definitely be seeing some of these before a year is over. And yes, as far as I'm concerned, photographing an accidental skull definitely counts as creating one for this project. Thanks again and keep sending ideas! Cassette Tape cut with Scroll Saw. Made entirely of 5's except for one 1. While on vacation in March 2009, I was browsing the art books at a book store, when I came across Noah's Skulls book. I flipped through the pages and was amazed at all the different materials used to make skulls. When I got back home, I found the blog and facebook page. I started following the creations daily and actively commenting. At this point of the project there were submission posts only. 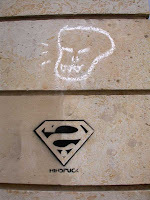 In June 2009, Citizen Agent and Tatman started posting weekly skulls that they created. June is also my birth month, for which I celebrated with a huge party. To keep this kid friendly...basically my best friend Kit McSmash gave me the Skulls book that night. Noah Scalin showed up to help me celebrate and also signed the book. I think that was the moment I knew I was meant to be part of the project. Fast forward to March 2010...After months of getting to know Noah, Citizen Agent and Tatman and participating on the blog by submitting my own skull art, the guys asked me to join the team for the 4.0 year. Citizen Agent came up with the name "Dia de la Abby", because of my obsession with Dia de los Muertos (Day of the Dead). During the 4.0 year, I, Abby aka Azurafae made 53 skulls (a skull a week) using a variety of mediums including paper, paint, fabric, accessories, clay and food. I like teaching people how to make things, so there are separate tutorials for 27 of 53 skulls. There are some tutorials included with the Dia de la Abby posts. During the 5.0 year, I made skulls at least once a month. Some of the skulls will also have tutorial. I have included a link to each coordinating tutorial. From the 6.0 year and beyond, I will share my skull artwork as I create it. 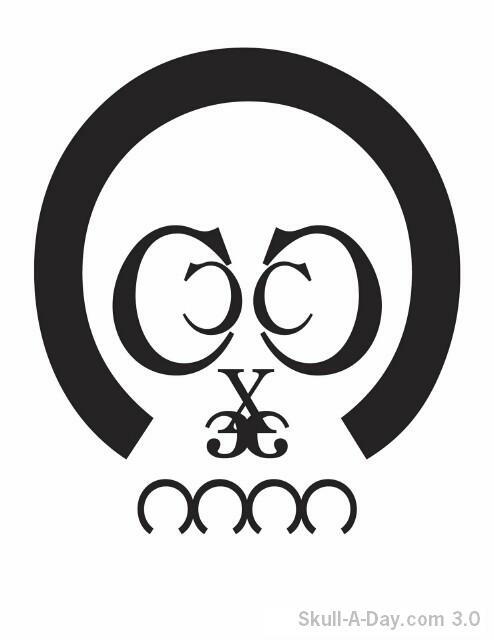 Citizen Agent, “C” was born in Skull-A-Day on June 6, 2007 at 11:48AM to the parents of Noah Scalin and Blogger. Agent C attended the Scalin School of Skulls during the next 362 days. Although C struggled with attendance, Citizen graduated with honors on June 3, 2008 with a degree in commentary. After graduation C spent the next few months in seclusion exploring their purpose in life. It was during this time in seclusion that Scalin offered C a job as an editor. Emerging from seclusion Agent C joined in the newer formats of facebook and twitter in order to explore other outlets for commentary. 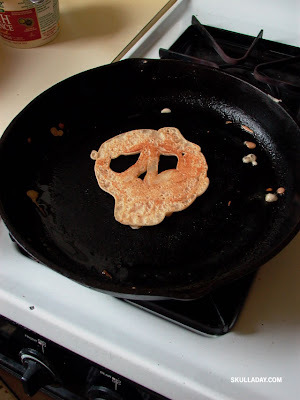 Citizen Agent took up co-editorial responsibilities at the start of Skull-A-Day 3.0. During Year 3.0, Agent C posted ‘C-Rations’ every Monday and a few more during the following year. In Skull-A-Day 4.0, as part of the ongoing Flashback Friday feature, C offered a peak behind the mask when they counted down their favorite skulls from the original project with new commentary including Citizen Agent’s origin story. 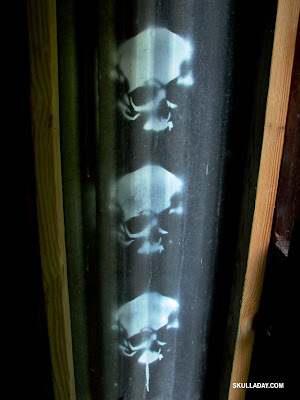 In the beginning it started with a simple search for "skull cabinet knobs". 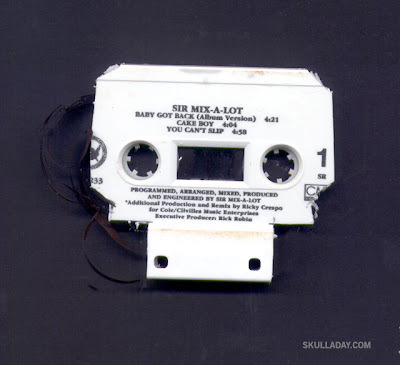 The date was around the 23rd of June, 2007 and one of my search results yielded a link to a project called "Skull-A-Day". Although I didn't find any cabinet knobs; I did find something that spoke to me and has now become a part of my daily life. Being able to see the daily posts from almost the beginning has been an extreme pleasure throughout these past years. Being asked to be a co-editor starting with year 3.0 was a thrill since it allowed me to get involved with so many great artists making great skull art. When Noah posed the challenge to Citizen Agent and myself to make a weekly skull for the 3.0 year I felt obligated to accept. 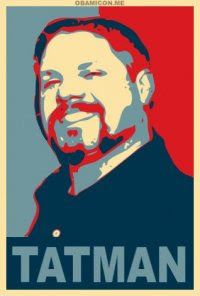 I titled my posts "Tuesdays With Tatman" because I got to share them with all of you. Here's the list of those weekly skulls, including more that I will be adding as I get them done. The weekly skull challenge was a real eye opener to the true dedication that a daily 365er endures. Keeping creative and motivated was tough and I give tons of kudos to any and all of you who try and/or accomplish such a feat. Thanks to all of you who have supported me, the Skull Team, and the Skull-A-Day project and thanks for checking out my skulls. 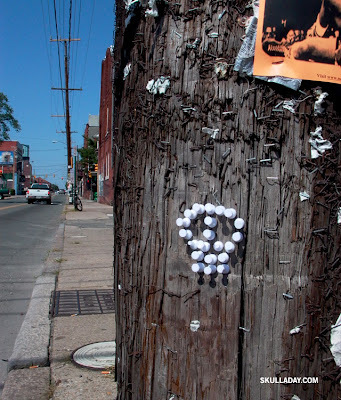 I lived in Richmond, VA with my highly creative family until I was 18. I have been crafting since I was a toddler with my strength being sewing. There is a long history of fiber arts in our family, so it's thought to be a given that everyone (female and male) know how to at least sew. I moved to Philadelphia, PA to attend The Art Institute of Philadelphia to pursue my passion for Fashion Design. There I refined my sewing skills and fell in love with draping and pleating fabrics into sleek sculptural forms. I also became very interested in the history of art and fashion and how it relates to today's world. After I graduated college, I moved back to Richmond, VA to work on a plan for my fashion designer goal. After a few months of living in Richmond again, I meet my now husband and fell in love. We got married and had a surprise daughter. As the years have passed and she has grown, I've been refining my art skills which include, machine sewing, hand embroidery, pattern making, pattern alteration, fabric manipulation, crocheting, wire wrap jewelry, beading, drawing and recently painting. I've been applying my skills to new mediums like embroidery and beading on canvas and drawing with paint canvas to produce visually stimulating art pieces. I'm influenced by Betsey Johnson, Elsa Schiaparelli, Rudy Gernreich, Paco Rabanne, and Issey Miyake. I love the sculptural and quirkiness of their creations. Their innovations and design techniques make me continue to think of new and interesting ways to make my creations come to life. I am fascinated with Day of the Dead/Dia de los Muertos, Catrinas, Papel Picado (Mexican cut paper), Sugar Skulls and related aspects to the three day ancestral festival. I have no Mexican heritage, but the bright colors and beautiful flowers mixed with the skeletons and skulls is an intriguing thing. I love the fact that they remember their ancestors in such a beautiful and positive way. It's a celebration of life. 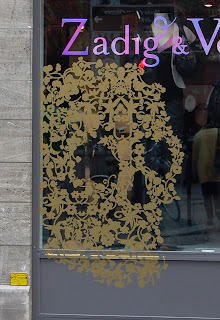 I started my blog, in March 2009 to document my art as well as other fashion, art and history related interests. 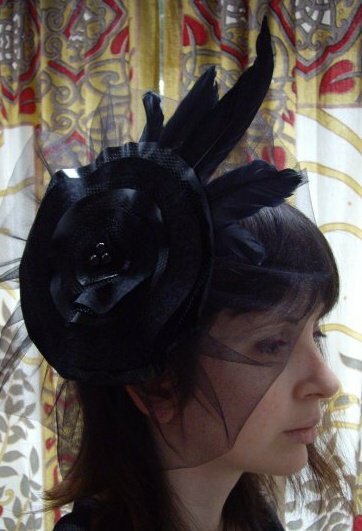 In October 2009 I opened my ETSY store, Azurafae, to start selling my hand made fashion accessories and soon my art. In December 2009, I made a Facebook fan page, so people could keep track of when I make new things to sell and when they are listed on ETSY or available for custom order. I have NATO to thank. What is this an interrogation? What are you a bunch of Communists? 16. WHAT IS YOUR FAVORITE THING ABOUT YOURSELF? 17. WHAT DO YOU MISS THE MOST? What are you part of homeland security? 25. DO YOU BELIEVE IN GHOSTS? 30. LAST MOVIE YOU WATCHED? 31. SAD OR HAPPY ENDINGS? 37. WHAT WAS YOUR FAVORITE CLASS IN HIGH SCHOOL? Justin Lovorn (a.k.a. Tatman) is your typical/not so typical skull loving guy. He is a big fan of music, tattoos, art, sports, and friends. He especially loves skulls, not just because they are a universal symbol of death, but because they can be so much more. He thinks a skull can make you feel and think of so many different things (not just death), depending on how it's presented. Skulls are Tatman's daily memento mori. 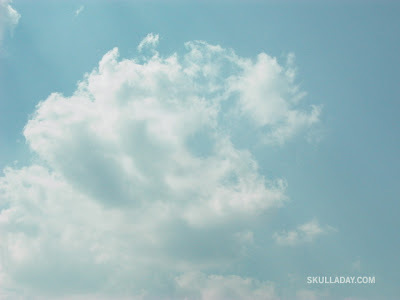 A skull asks him, "Did you remember to live to the fullest today? Did you need to be reminded that life is short? Do you feel like your skull has made a difference?" 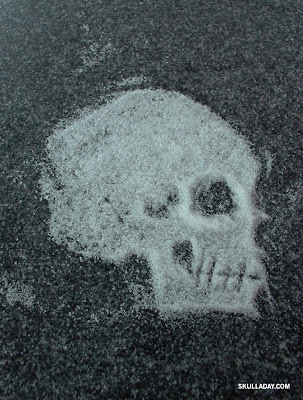 It's only a matter of time until our own skulls will be laid to rest...FOREVER. 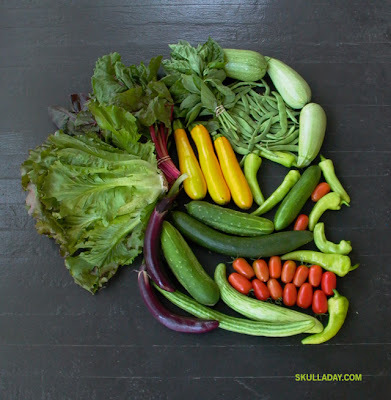 Use these skull images to remind you that every day is made for living. Every day is made for Skull-A-Day. My name is Noah Scalin and I made a Skull-A-Day for a year. 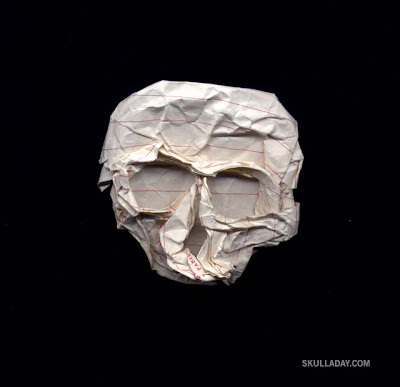 I started by making an orange paper skull on June 4th, 2007 and posting it online saying, "I'm making a skull a day for a year". 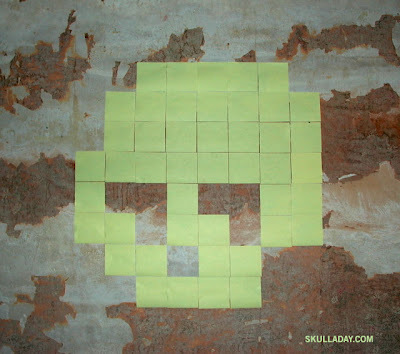 I made my 365th skull on June 2nd, 2008 (and even posted a bonus skull the day after since it was a leap year!). 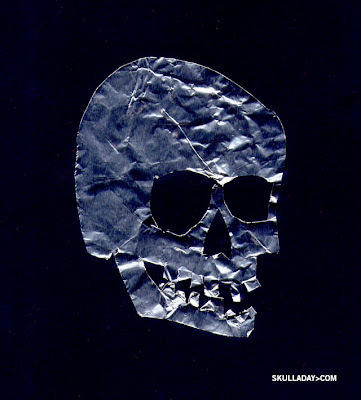 June 3rd, 2008 marked the start of year two of the project (called Skull-A-Day 2.0) and featured daily submissions from readers. 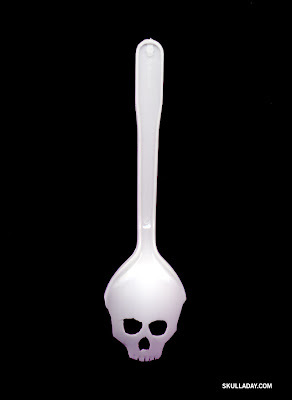 In October 2008 a book based on the Skull-A-Day, featuring 150 images from the first half of the project, was published by Lark Books. It's called SKULLS and you can buy it from your local independent bookstore or online via Amazon.com or Barnes & Nobel or Powell's Books. June 3rd, 2009 marked the start of Skull-A-Day 3.0 in which the project continued to feature daily skull submissions, but with the addition of two new site editors: Skull-A-Day überfans Tatman and Citizen Agent, who both made a year of their own original weekly skulls as well (see them HERE and HERE)! 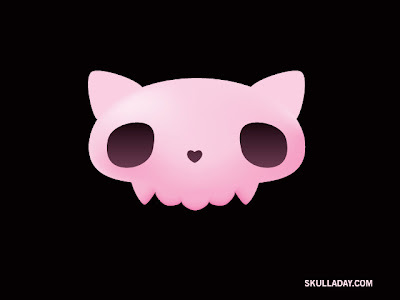 June 3rd, 2010 marked the start of Skull-A-Day 4.0 in which the project continues to feature daily skull submissions, but with the addition of one more site editor: Abby AKA Azurafae, who is also making her own year of original weekly skulls (which you can see HERE)! 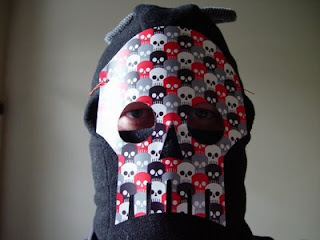 June 4th, 2011 is scheduled to be the first official international Skull Appreciation Day (with your help!). 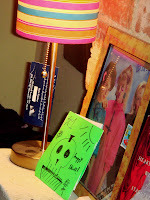 To read some nice things said by others about the project and the book check out the Skull-A-Day PRESS. And to find out what I do when I'm not making skulls check out my socially conscious design and consulting firm Another Limited Rebellion. However if you want to send your skull art please follow the directions on the Submissions page. ONLY submit images you've made yourself . 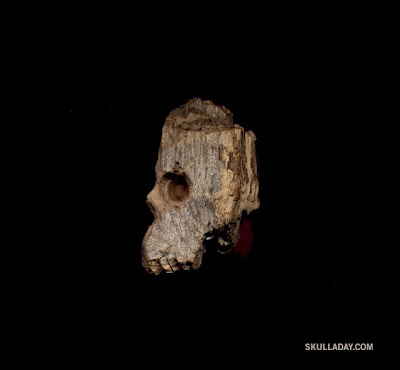 Photos you've taken of Simulacra (found objects or items in nature that unintentionally look like skulls) are acceptable. [UPDATE 1/4/09] The only exception is if you are showing off your personal collection of skulls in a group shot to be considered as a "Skull Fanatic". 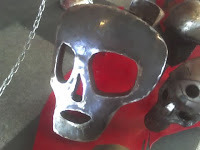 PLEASE NOTE: We do NOT post commercially produced items, however if you want to give away one or two of a skull item to our readers we will consider making a giveaway post please contact us for more details. Do NOT send photos you've taken of art/logos/graffiti/products made by someone else! Do NOT send Tattoo pictures unless you are the tattoo artist. Do NOT add any text to your image (i.e. your name/website/copyright). We will credit you in the body of the post. Do NOT send images with Date Stamps on them. Be sure to include your name and location as you would like it to appear on the site. Let me know if there is a website you would like your name linked to. Please attach the actual image to your e-mail and NOT just a link to your image. Larger file sizes are recommended/encouraged (a minimum of 640 x 480 pixels is preferred). If you send multiple items we may only pick one or two to include, so be selective. Do NOT hurt any animals (or people!) to obtain a skull! Seriously not cool. Please keep things family friendly, kids frequent at this site. We won't show Not Safe For Work (NSFW) images on the site, but will link to them occasionally if they are tasteful. PLEASE NOTE: When you submit work to Skulladay.com you agree to release it under a Creative Commons Attribution No Derivatives License. This means that we have the right to publish your work (on the website and in possible other places, like books, without any payment to you), but the work still belongs ultimately to you and we must credit you if we use it. But don't take our word for it, read the Creative Commons license before submitting anything! Please be patient it may take up to 7-8 weeks for new submissions to be posted and due to the large number of submissions NOT ALL WORK CAN BE SHOWN (sorry!). 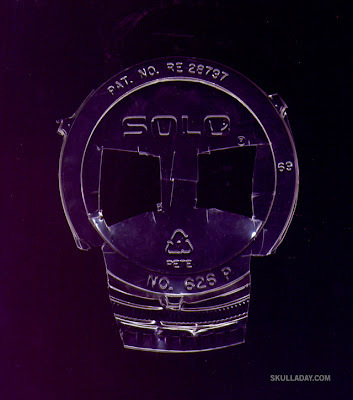 However, you can see any and all items in the sidebar if you post them to Flickr and include the tag "skulladay". 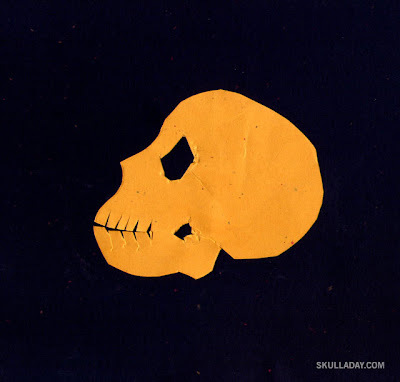 PLEASE NOTE: No permission is necessary to repost images from this site to your own blog, we just ask that you please give proper credit to the artist that created the piece and provide a link back to Skull-A-Day and/or the specific post it came from. The more links the merrier! Thanks for your support of the project.